Here are photos from the grand finale of 2017 Oranyan Festival. A major highlight of the event was the wearing of Sese-Efun (White Coral Bead Crown) by the Alaafin of Oyo; his Imperial Majesty, Alaafin Oba Lamidi Adeyemi III. 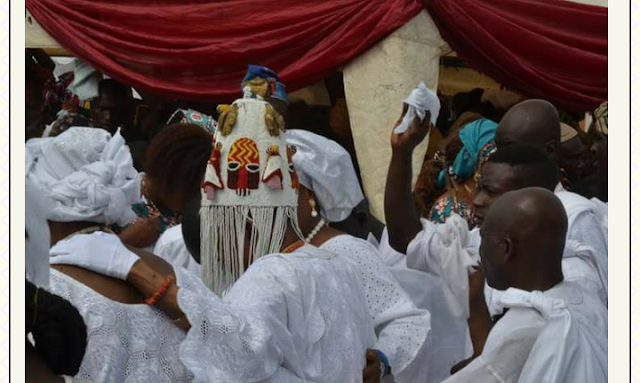 According to reports, the Sese-Efun crown was made centuries ago and historically it has only be worn seven times by the successive Alaafins. According to the historians, Alaafins do wear the crown only after ten years of coronation. Another highlight of the event was the performance by Ayabas to showcase one of the best cultural tradition and Oyo historical pre-eminence was "igba titi" otherwise known as calabash drumming. While this was being done, the Ayabas were singing the praises and eulogising the past and the present Alaafin of Oyo. The festival indeed attracted several traditional rulers, government functionaries, artists, cultural enthusiasts, Oyo sons and daughters at home and from diaspora. Guests were entertained by the cultural troupe and masquerades.